Don’t let the smoke get in your eyes! Or if you can’t avoid it, just try and enjoy yourself anyway. Because, like, there’s really not much you can do. You’re in the middle of tens of thousands of people, the ground is vibrating, and you’re getting rained on by cardboard from exploded fireworks. Try and see the beauty in it. That’s the situation we found ourselves in during today’s massive and hugely attended mascletà. With a finale that just went on and on, and huge billows of smoke, this was Fallas 09’s most intense (and fun) mascletà yet. 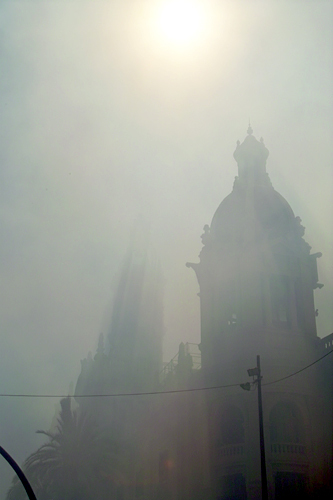 your pictures of Valencia’s Fallas are really awesome. Good work!! Why not? You better stop reading or site right now – otherwise you will miss Fallas too much and you will do anything to be here. More fun pictures and videos of Fallas on the way.